Now that the snow has finally melted, we've started taking some of the horses out to pasture this week. It's not so they can graze, since the grass hasn't come up yet, but for exercise and to get them out of their corrals so we can get in with the tractors to clean out a winter's worth of manure. I took this photo of Alayne with blind Kiowa this evening when we went to get him and bring him back to the barn. Kiowa is the only horse we have who plays "hard to get" when it's time to come in. Even his pasture buddy, Cactus Jack, will head right for us when he hears us walking towards them. We put the halter on Cactus and lead him back to his corral; he's happy to go in. Kiowa, though, just can't let himself be "caught" ... unless, of course, there's some grain involved. Then it's just a question of shaking the grain bucket and Kiowa comes right on over. While he's got his face buried in the bucket, we toss the lead rope over his neck, and when he comes up for air, we slip the halter on his head. We give him a couple more mouthfuls of grain, and off we go to the barn. Or, from the horse's perspective, it would appear that this scrawny blind Appaloosa has managed to train his handlers pretty well. Hmm. The test results on our blind cat Turtle -- bloodwork, ultrasound, and X-rays -- so far had shown only one sign of something amiss. The X-rays revealed some gas-filled loops of bowel, suggesting possible obstruction. Thus our primary care vet, Dr. Brenda Culver in Helena, did exploratory surgery today. Sure enough, she found two sections of Turtle's intestines where the tissue wall was so thick that the intestine was constricted enough that only fluid or very loose stools could pass by. This would cause malabsorption of nutrients, explaining her recent weight loss. Brenda removed both sections of intestine ... in one case taking out 1 1/2 inches of bowel and in the other case taking out 3 inches. (Brenda told me this evening that in a cat Turtle's size, you can remove up to 12 inches of intestine before you start affecting its ability to do its job.) The thickened tissue could result from an inflammatory response of some sort, or it could be gastrointestinal lymphoma. Brenda is sending biopsies of both sections of intestine to Colorado State University's vet school to find out. In case it is lymphoma, Brenda also did a biopsy of Turtle's liver so we'll know whether it has spread to that organ. Turtle's mesentery (or abdominal) lymph nodes were swollen, too. This could be a normal response because of the existing "insult" to the intestine, or it could mean lymphoma there, too. Again, another biopsy for Colorado State. Brenda told me the good news is that gastrointestinal lymphoma in cats is -- unlike other forms of lymphoma -- not only treatable but curable as well with chemotherapy. (Unless, of course, it's spread to other organs.) Over the years we have lost more animals to lymphoma than any other single disease, so I was really glad to hear this. It will be sometime next week before we learn the biopsy results. Turtle came out of surgery just fine and Brenda reports that she was already purring! After doing Turtle, Brenda moved on to a much simpler case ... neutering our new arrival blind Brody and doing a dental on him. His teeth were in pretty good shape; he had one cracked tooth that needed to be removed, but otherwise his pearlies are shining. Both Turtle and Brody will stay in the hospital over the weekend and we'll pick them up early next week. This afternoon we posted on our main Web site the sanctuary's 2006 annual report. Regular blog readers will probably recognize many of the photos in the 4-page report, since it's a snapshot of what happened last year. The financial information is on the final page. Because the sanctuary runs 100% on donations, our annual report is designed to show how we spent our donors' generous gifts during the year and what we accomplished. Alayne and I are incredibly grateful for the contributions that make this place possible. Without those gifts, we could not provide a home for these disabled animals. So on their behalf, thank you! The annual report is a 1.7 MB PDF and you can download it here. Barbara Edwards, the quiltmaker from Seeley Lake, Montana, who is raffling off a beautiful quilt she made to benefit the ranch, asked me to post a reminder that the deadline for raffle ticket sales is this Saturday, March 31. For more info on how to purchase tickets from Barbara, please see the original post here. I took our new arrival blind Brody and blind Turtle the cat to our vets in Helena this morning. 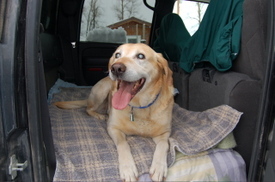 This is a photo I took of Brody after I lifted him into the truck before we left. Brody was going in to the clinic to be neutered, have a heartworm test, a complete blood count and chem panel work-up, a dental, and an eye exam. Depending on the outcome of the heartworm test, he might have an echocardiogram of his heart as well. Turtle, shown here in an earlier photo after her eye surgery, has become dehydrated again, has started to vomit occasionally, and was still not gaining weight after losing a lot earlier last month -- this despite the fact that she does eat pretty well. We took her to see our vet back in February because of weight loss and dehydration, and after a week in the clinic and IV therapy, she bounced back. Our vet, Dr. Brenda Culver, ran a battery of tests then and everything was normal, which really perplexed us. But clearly something is wrong, so she went in today for more diagnostics. The only definitive results we have back this evening are on Brody's eyes. We knew he had cataracts ... you can certainly tell that from the photo above ... but cataracts can be secondary to other eye diseases, so we never assume it's only cataracts. And if it IS only cataracts, there may be a chance of doing cataract surgery to restore vision. At this point Brody's eyes do not appear to be causing any discomfort, but detached retinas can become painful, so this is something we will have to keep an eye on (so to speak). If you think you see some snow on the truck window behind Brody ... you're right! We woke up to a heavy, wet snowfall this morning, coming down so thick it blocked our satellite signal for about an hour. As for the green sheets hanging over the back of the seats ... well, that's our rather useless attempt to keep dog hair, mud, hay and other assorted ranch debris off the seats. Sometimes our hearts break for animals we never even meet. Our friends at Spokane County Regional Animal Protection Services in Washington contacted us last week about an old, blind German Shepherd they named Sweetie. She was dumped at the shelter by her owners earlier this month. This is the photo the shelter staff took of her. This senior girl is a little slow moving and can be hesitant at first, but that is probably due to impaired vision and bad hips. Still, she really enjoyed getting out for a short walk and having some attention. She is 10+ years old and about 85#. Evaluated on 3/17 and this is what they found: Low evergy level. Level 1-2 temperament and trainability, dog is probably BLIND. "Afraid behind the kennel gate. Ask for staff to help get her out for you!" Passed food, pig's ear and toy tests. No children, please, due to dog sight impaired. Has not been seen with children, appears gentle. Good with cats, greets and turns away. Good with other dogs. Approaches dogs appropriately and seeks friendly interactions. On Friday we contacted the office of our veterinary ophthalmologist in Spokane, Dr. Bill Yakely, and scheduled an appointment for Sweetie for Tuesday morning. The shelter had agreed to take her to the appointment so we could have Dr. Yakely assess her vision and find out what was wrong with her eyes. Then yesterday, on Sunday, the shelter contacted us to say Sweetie had suddenly gone downhill over the weekend. She was bleeding internally from her rear end, her stools were tarry, and she became very weak ... and then she went down and couldn't get up. They euthanized her Sunday afternoon. I know the lady at the shelter who put Sweetie to sleep -- she's a compassionate, caring soul who has sent many disabled animals our way -- and thus I know this old, blind girl had a loving hand at the very end. So here we are, heartbroken over a dog we never knew. And angry with people who would turn in their elderly dog at a shelter and drive off, leaving it to die. And die she did, just a couple of weeks later. How very sad. 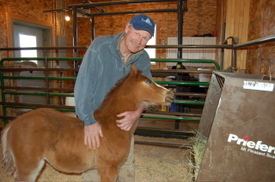 On Friday afternoon our equine vet, Dr. Bill Brown of Missoula, came out to the ranch to work on several of our horses, all of them old, blind ones ... with one exception -- 6-week old Cash! It didn't take Bill long to fall in love with little Cash ... about 60 seconds, as I recall. Pretty clear from the photo, don't you think? 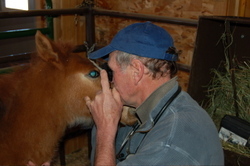 Bill also did an eye exam, and he isn't convinced Cash is blind from aniridia, or the absence of the iris. He thinks Cash may be missing other structures in the back of the eye. However, he will get a much better look when Cash is under anesthesia next month. Meanwhile, Cash is growing and growing ... and doing just fine! 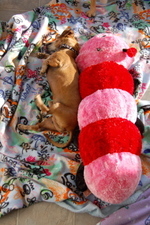 Alayne took these photos yesterday afternoon of Bailey making nice with the giant caterpillar. 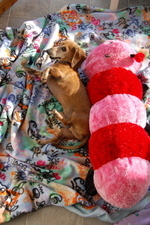 It was just last week that we posted photos of Bailey giving the caterpillar a solid thrashing. That was then, this is now. Having shown the caterpillar who's boss, Bailey has now decided he likes Mr. Caterpillar after all. 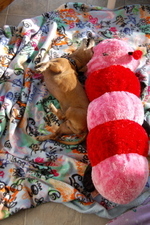 In fact, he loves to nap with Mr. Caterpillar. He drags his new friend over to the bed when it's siesta time. The fleece blanket Bailey is sleeping on was part of a big box of fleece bedding that Margaret N. in Seattle shipped us several weeks ago. Yesterday Margaret's latest shipment -- 46 lbs of fleece blankets! -- arrived, and last night Alayne went from cot to cot, and crate to crate, laying out the new blankets. The animals just love the fleece bedding. Thank you, Margaret! I forgot to mention earlier that we recently posted the Today Show video on YouTube to make it easier for folks to share it. The video quality isn't as good as the Windows Media and QuickTime versions we have posted on our Web site, but you can't beat YouTube for ease of use in sharing video. The fuzzy screen shot -- we think that's Daisy the Dachshund in the background -- is what YouTube chose, not us, and we haven't figured out how to change it yet! This afternoon I was walking past the cats' outdoor enclosure when I heard this very loud "meow-meow- meow!" It was the kind of insistent meow that's designed to get your attention. I looked over and saw blind Cinder happily perched inside the cat condo. It's like she wanted me to notice her in there. I hurried back to the house to get the camera. Cinder, who lost her sight from progressive retinal atrophy, is the most fearless blind animal we have -- and we have 50 blind animals at the ranch, so that's saying something! For example, she climbs up on the wall shelves in the cat house without any hesitation, and then leaps down to the floor 5 feet below with a carefree "bombs away!" attitude. You can tell by the way her feet hit the floor she doesn't really know where the surface is before she goes airborne, but land on all four feet she does. She will go anywhere and explore anything. Because Cinder doesn't look blind -- see how bright her eyes are! -- visitors don't realize anything's wrong with her. They'll come into the cat house, see this beautiful black cat 5 feet up on a wall shelf meowing at them, and they'll reach over to pet her ... only to have Cinder suddenly startle when their hand touches her head because she didn't see it coming. 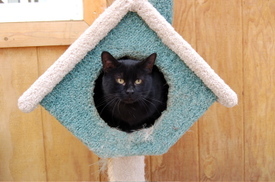 When the weather started warming up in recent days, we began leaving the cat house window open that provides access to the outdoor enclosure. Of course, being blind Cinder didn't know what the window opened onto, but she realized some of the other cats were going through it ... and in her typical fashion, Cinder decided to discover for herself. Now she spends a good part of every day outdoors, exploring the enclosure or just hanging out in the condo.